I think that Flynow.my is cool interface website, you can check on the main 5 airlines only, such as MAS, Airasia, Tiger airways, Jetstar Asia Airways. 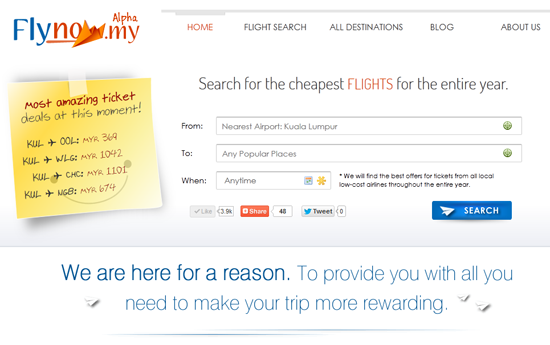 As traveler, you will find for the cheap tickets from their airlines at same time so easier! From start, you choose where place that you want go on the dates, then you will see different prices in a month! It is very easy for me to see which is one cheapest price in a month! You can see the yellow colour highlight on the months so well, it means the prices are cheapest tickets! At your left side, you can drag or arrange your info of flights, and can add how many flights that you want to plan your trip so easily and calculate the total prices. You can choose "Buy ticket" or "Book Hotel" before you confirm, and sure make you remember the original & cheapest prices because you will be re-direct to the company's website before you buy online. 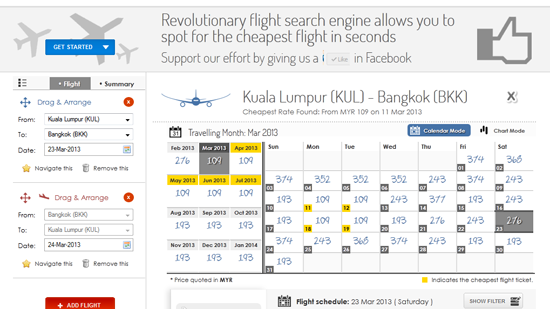 For me, this is easy interface only, especially I prefer to see all prices on different airlines in a month in Flynow.my only! If you have any complaint on this issues problem, can visit their facebook @ myflynow.